The ANYCOM USB-250 adapter with Bluetooth® wireless technology is one of the first Bluetooth adapter world-wide to follow the new Bluetooth 2.0 + Enhanced Data Rate (EDR) standard. Bluetooth 2.0 + EDR offers a three times higher data transmission rate with up to 2.5 MB/s, has an improved performance with several simultaneous connections and is fully backward compatible to previous Bluetooth versions. 3 times faster transmission speed. 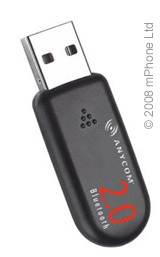 Even with Bluetooth devices not based on the current Bluetooth standard you will see a performance improvement, as the ANYCOM USB-250 optimizes each connection. Because USB-250 supports USB Hub Extension, it is possible to use your Bluetooth Mouse or Keyboard before your operating system is started, which eliminates the requirement of a another Mouse or Keyboard when the computer is in maintainance mode.